Today has been the day where Catherine Middleton and Prince William say I do, in front of the whole world, Royal Family, Celebs and MP around the world. To be quite honest the whole day was just like a big fashion week in a day. Due everyone wearing outfits from British designers and International designers. The morning was covered by every media company possible. Everyone wanted to know what the brides dress maker was..
Now the secret has been let out. The dress and shoe designer was Sarah Burton who is head the fashion label Alexander McQueen. Catherine wore a white and Ivory wedding dress, in a lace design which hand-engineered (appliquéd) using the Carrickmacross lace-making technique, which originated in Ireland in the 1820s. Her hair was down under a veil which was made of layers of soft, ivory silk tulle with a trim of hand-embroidered flowers. The tiara was presented to Princess Elizabeth (now The Queen) by her mother on the occasion of her 18th birthday. The wedding shoes have made hand-made by the team at Alexander McQueen and are made of ivory duchess satin. Whilst Kate was wedded up. Her Husband to be William wore a Military uniform in scarlet read. They both looked stunning! Kate's mum Carol Middleton wore a sky blue wool-crepe coat dress w/matching satin piping waist over sky blue silk dress. The gentlemen wore morning suits from varies designers. In the Middleton family Pippa wore the same designer outfit dress in white. BFC Ambassador Samantha Cameron looking beautiful in Burberry teal dress, accessorized with Erdem hair clips, along with Prime Minster David Cameron in a morning suit. Duchess of Cornwall in ice green Anna Valentine with Philp Treacy hat paired with Jimmy Choo shoes. Her Majesty is wearing yellow, which was quite bright next to the Duke of Edinburgh's scarlet ceremonials. However one couple everyone was eager to know what they were wearing. The Beckham's. 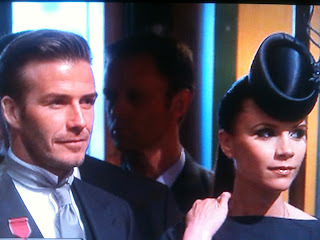 Victoria turned out in a midnight blue VB dress and matching military cap-ette by Philip Treacy. Whilst David tuned out in a morning suit from Ralph Lauren Purple label, with Philip Treacy tophat, personalised DB sterling sliver cufflinks with accented crocodile braces; hasn't worn his hat all day as he's afraid of hat hair!.He's been carrying it around the whole time. Along with the celeb theme Sir Elton and David turned out in dashing suits. The Service went in smooth fashion. Kate and William looked relax, calm, and collective throughout the service. Their new title is Duke and Duchess of Cambridge. **We have just found out that Kate Middleton is the newest queen-in-waiting to join a historically fetching lineup of princess brides** After the wedding the newly wed couple, travel in special carriage to Buckingham Palace. Where the Royal Family met up with them. 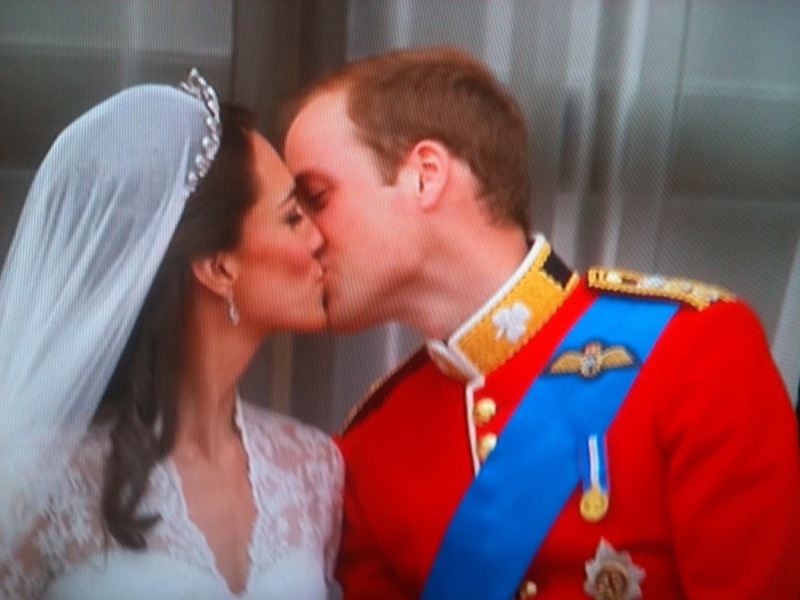 Around 1:30pm the Royal Family came out into the ballcony, where Kate & William kiss in front of the tv camera's, their families, the crowds outside the palac, and people around the world. Later on to day the familes of Kate and William, had a dinner to celebrate their newly wedded bride and groom. Later onto tonight they will hosting a party for friends and extended family. 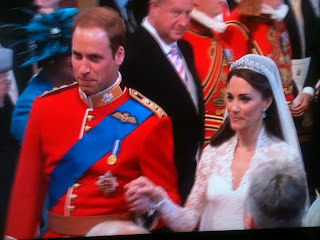 To finish off the wedding the Royal Couple will be off on honeymoon which the Royal Family has arrange in thier honour.